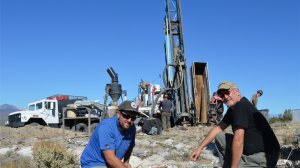 VANCOUVER (miningweekly.com) – Canadian explorer Nevada Zinc is working towards publishing a maiden resource estimate for the flagship Lone Mountain zinc project by the end of the second quarter, as it continues to evaluate the best ways to monetise zinc products. Toronto-based Nevada Zinc in January completed a technical report on Lone Mountain. The company is considering various metallurgical processes to extract the most benefit from the oxide ore, president and CEO Bruce Durham tells Mining Weekly Online in an interview. Lone Mountain is located close to Eureka, Nevada. The company’s 224 claims at Lone Mountain are spread out over 20 km2 and surround the historic Mountain View zinc mine, which was acquired by the corporation in 2015. The project is easily accessible via paved and gravel roads north-westerly from Eureka where all essential services are available. The project includes options, leases or purchase agreements to acquire 100% interests in all properties along the key structural trend over 3 km in length. According to Durham, the company will probably undertake another round of drilling between now and the early part of the second quarter, before calculating an initial resource on the property. To date, drilling has been focused on the shallow, surface-to-75-m depth Mountain View mine land package, while also looking at the Discovery Zone further to the west, where the geology team has drilled about 180 m of strike length, 100 m to 150 m in depth. “We believe the average resource thickness is between 30 m to 40 m in the Discovery Zone, and it is shallow enough to fit most of the resource in an openpit,” Durham suggests. To date, Nevada Zinc has completed 83 drill holes, for a total of 12 200 m between 2014 and 2016. The Discovery Zone has been drilled over 180 m in length, over a dip length of 250 m, with an average thickness of 40 m.
Durham said mineralisation remains open for significant expansion, and no drilling has been undertaken to test for deep sulphide yet. He explains that Nevada Zinc has been trying to stay ahead of the curve owing to the fact that they are dealing with an oxide resource. Metallurgy is important in nonsulphide zinc deposits. Metallurgic testing to date has shown that at a specific gravity of about 3.03, more than 79% of the zinc was recovered into 31% of the mass at a grade of 36.7% zinc, while about 90% of acid-consuming gangue minerals (calcite and dolomite) was rejected. “This indicates that a saleable concentrate can likely be produced by dense media separation (DMS) only. Unlike some nonsulphide zinc projects, the metallurgy looks fine at this stage,” he said. Further, leach testing by Finland-based process specialists Outotec, using standard test parameters, showed a high dissolution rate; dissolution not significantly different between 75 °C and 90 °C; gangue also dissolved quickly; and that preconcentration will drastically reduce costs for acid. Durham notes that carbonate reduction is key to lower acid costs, and a pH of 2 – the same as lemon juice – or lower showed fast and “exceptional” leaching results. The leach cycle is exothermic (self-heating), producing zinc that can be recovered as special high-grade zinc product, or an intermediate zinc sulphate product, which is a direct saleable product. “We can actually bypass sending concentrate from the DMS process to smelters and send it directly for leaching on site to produce zinc sulphate fertiliser. This is one of the lines we’re investigating, while we are also working with a company out of Australia, looking at leaching this style of mineralisation with ammonia solution to extract the zinc without dissolving the calcite and dolomite. “They’ve taken some sample material and started bench-scale processing. With this process, one goes directly to zinc oxide – a premium product to the actual zinc price. In the case of the zinc fertiliser – zinc sulphate – we would get more value than the dollar value of the zinc price,” he stated. Durham states that the company will potentially start selling zinc sulphate fertiliser to local consumers, representing a low capital expenditure opportunity to start earning revenue. He notes widespread zinc-in-soil deficiencies in the US, and the world in general, owing to zinc uptake by plants over decades. The dissolution of zinc minerals (oxide and carbonate) in sulphuric acid produces zinc sulphate, which can be used as fertiliser. Zinc sulphate is the product of choice for zinc fertiliser, pesticide, fungicide, in rayon and for electroplating. P&E Mining Consultants considers that the property hosts significant high‐grade zinc mineralisation and warrants further exploration. P&E recommends that the next exploration phase, budgeted at C$3-million, should include additional reverse circulation drilling, diamond core drilling, geological mapping, geophysical surveying, geochemical, metallurgical and environmental studies. “We continue to believe in tremendous “blue sky” opportunities to create shareholder value at Nevada Zinc. Our exploration has uncovered excellent shallow blue sky opportunities at Lone Mountain, while there remains significant potential for sulphide mineralisation at depth,” he says. Zinc had outperformed its base metal peers in 2016, rising 70% in 2016 alone to about $3 000/t. Global demand for zinc is expected to rise 2.4% a year between 2017 and 2021, pulling the price northwards towards historic highs around $4 000/t. Meanwhile, Nevada Zinc has a portfolio of gold exploration targets in Canada’s Yukon Territory, billed as one of the most important new developing gold districts in the world. Nevada Zinc controls a large land package along the Tintina Gold Belt, a 2 000 km gold district spanning Alaska and Yukon and which hosts well over 100-million ounces of gold. Nevada Zinc’s three priority projects in the Yukon are VIP, Livingstone and Goodman. All three are 100% owned, have identified geochemical and geophysical targets and have never been drilled. “The gold opportunities in the Yukon is really what the company was founded on in 2010. We have a portfolio of more than 40 properties that we started out with,” Durham states. One of them, VIP, is a large land position west of junior (at the time) Kaminak Resources, before any drilling started on their Coffee project. “As it turns out, we have over 800 claims west of the Coffee project, which was last year sold to Goldcorp for $521-million. We’ve done some basic geochemistry and have developed some targets on it,” Durham says. The VIP project covers 17 km along the main structural trend from Goldcorp. Acquired in 2010 before the Kaminak gold discovery, Nevada Zinc in 2016 outlined gold targets that are currently drill ready. Nevada Zinc also holds a 20 km land package called the Goodman property, south west of Victoria Gold’s Eagle gold deposit. Last year, the company flew an airborne geologic survey and found similar felsic intrusions to the Eagle deposit. “We’ve also found felsic intrusion boulders with pyrite in them, pointing to a strong geophysic anomaly, in an area where placer mining activity has been ongoing for years,” Durham states. Further, Nevada Zinc holds the Livingstone gold project, representing an untested gold target. The company has completed five years of work on the expanded 14 km land position, grooming the project with drill-ready targets. According to Durham, very large gold nuggets have been recovered in placer mining from five creeks in over 10 km of the property, with placer activities dating back a hundred years. “We’ve now found gold mineralisation in bedrock in place at the top of these creeks. We’ve compared the geochemistry of these nuggets to the bedrock on the property and it matched. A government sponsored mapping exercise has also identified a target to the west of the property, representing a very exciting opportunity for the company, he states. “We’ve had a number of joint venture proposals put to us to undertake exploration in the Yukon, and we are evaluating these. If we don’t decide on a partner, we’ll probably raise some money and go out there ourselves to explore these properties,” he says.